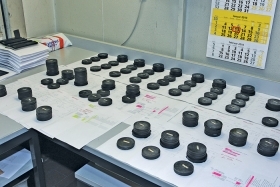 Continental techs blend ingredients for tire compounds and produce tiny tire samples, shown, that are tested for rolling resistance, traction and durability. HANNOVER, Germany -- In an unassuming series of rooms deep within Continental AG's expansive campus here, technicians test tiny tires, some barely a centimeter wide, on equally tiny dynamometers. The tires are made from experimental recipes of natural and synthetic rubber and other ingredients. The technicians are trying to discover a formula more valuable than gold. Continental's modern alchemists are working to create greener tire rubber formulations that last longer and roll with less resistance. In tires, like all things automotive, green is the new gold. Boris Mergell leads Continental's team in researching materials and manufacturing processes for car and truck tires. "Virtually every day, we try out new materials and compounds in our labs in the hope of achieving a greener tire," he says. "It's a balancing act between natural resources, synthetic materials and performance." Scientists working on Mergell's team create recipes constantly as they evaluate new ideas and untested compounds. Individual recipes are handwritten on small note cards and delivered to the Recipe Room, where future Continental tires are created. Forget those Hollywood sets that depict a high-tech research laboratory with access limited to those who pass a retina scan. This looks more like a cross between an old-fashioned hardware store and an apothecary. One wall of the Recipe Room is lined floor to ceiling with ancient shelves holding dozens of bins of natural and synthetic latex. Some samples look like milky ice cubes; others resemble coal. Another wall holds shelves stacked with vials of powders and containers of oils and cryptically labeled liquids. Technicians gather ingredients for each recipe and place them on trays purloined from the campus cafeteria. They fill small brown lunch bags with precisely measured and weighed dry ingredients. Glass beakers contain the liquids. Open bins hold chunks of raw latex. Some come from Continental's own rubber plantations in South America. Others are synthesized petroleum products. Precision is critical. Minuscule differences in recipes -- changes in the amounts of traditional ingredients or the inclusion of new elements such as sunflower oil -- can lead to breakthroughs in key tire attributes such as rolling resistance, traction and longevity. Says Mergell: "The secret is the way the different compounds in the tire interact. Each minor modification can lead to substantial variations in the overall picture." But more often than not, the minuscule changes hurt dynamic performance. For example, Mergell says, "The wrong composition can result in considerably poorer braking performance." Once the technicians have assembled the precise recipe, the loaded cafeteria tray moves next door to the Mixing Room, where the individual elements are churned. The result is a raw slab of never-before-tested rubber. The trial-and-error research approach can be frustrating and seem never-ending. One Continental technician, watching the recipe go into the industrial mixer, quipped, "This equals job security." But it also leads to incremental breakthroughs that collectively reduce worldwide energy consumption and conserve finite natural resources. When the slabs emerge from the mixing, they are cataloged and stored to await testing by other Conti technicians, who cut the slabs into a variety of shapes. From some slabs, technicians create tiny tires barely a centimeter wide, which are tested for friction, rolling resistance and longevity. Promising recipes undergo further development. Continental and other tire makers are responding to an urgent call by automakers for improved fuel economy. In the United States, automakers must comply with sharply higher targets for their corporate average fuel economy by 2016. They are scrambling for ways to add efficiency to their fleets. Better tires are one of the fastest and easiest ways to boost fuel economy. One carmaker estimates that adding low-rolling-resistance tires to a light truck can improve the truck's fuel economy by 1 to 2.5 mpg. In contrast, shedding 125 to 250 pounds adds only 0.3 to 0.5 mpg. Terry Connolly, General Motors Co.'s director of tire and wheel systems, attests to the gains accomplished by the research conducted by Continental and other manufacturers. He estimates that rolling resistance, a measure of energy lost while moving a vehicle, has dropped industrywide by about 15 percent in four years. "Traditionally, this kind of efficiency would have come at the expense of dynamic performance," such as braking, handling, grip and noise, vibration and harshness, says Connolly, who works at GM's proving grounds in Milford, Mich. "But we've demanded and received the same level of performance from today's generation of low-rolling-resistance tires as we've had in standard tires." Noting the research under way at Continental and other tire manufacturers, Connolly said: "We expect to see more improvement over the next three to five years, but I personally doubt it can match the recent improvements. Based on what our best suppliers are telling us, I'd expect to see rolling resistance drop another 6 to 9 percent." Because tires consume about 20 percent of a traditional vehicle's energy -- and 30 to 40 percent for electric vehicles -- additional gains in tire technology could lead to overall fuel-efficiency increases of at least an additional 1 to 2 percent. That is gold worth finding for automakers -- and tire makers.